This t-shirt is available in maroon, red and navy blue with white writing and gold with red writing. The back of the maroon reads "All Women Are Created Equal... Then A Few Good Women Become Marines". 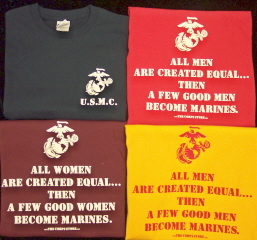 The back of the red, navy blue and gold reads "All Men Are Created Equal.... Then A Few Good Men Become Marines". The front has an Eagle, Globe, and Anchor with U.S.M.C underneath located on the left chest. It is 100% preshrunk cotton. Red and Blue are available in sizes ranging from small to 4XL. Maroon and Gold are available in sizes ranging from small to 3XL.